I have recently become reacquainted with an old friend: a drop scone recipe. I favored this scone for years prior to being introduced to the marvelous Cream Scone. It is a sad fact that in cooking...as with anything I suppose...when we discover something new and wonderful, we often abandon the old....even though the old might have been pretty wonderful too. 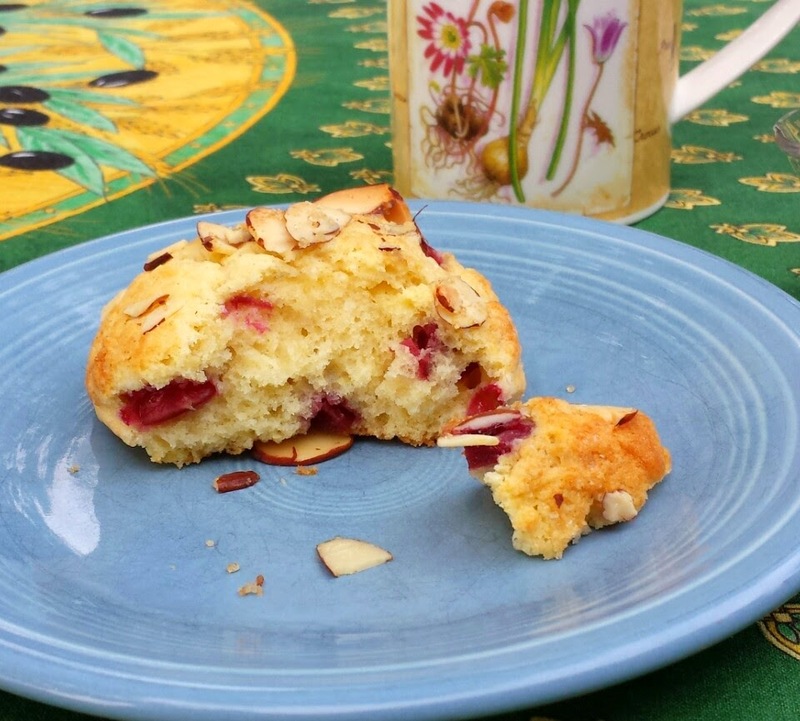 Having rediscovered it, I would like to introduce others to this old friend—given new life from the introduction of fresh sweet cherries—that in its own way is just as special and worthy as the cream scone that supplanted it. My rediscovery came about because of an email I received from a friend who is spending her summer in the Pacific Northwest. It has apparently been a banner year for cherries and she was wondering if I thought cherries might work in the cream scone recipe...or perhaps if I even had a special fresh cherry scone recipe. Unfortunately I didn't think I had a recipe for a scone that would handle the addition of fresh fruit. The cream scone dough is somewhat stiff and even if you were able to incorporate fresh fruit into the dough without crushing the fruit, it seemed to me that the water released during the baking process would make the resulting scone kind of gummy. I then remembered the drop scone recipe. It is from a little book called Biscuits & Scones by Elizabeth Alston. This particular scone incorporates a marbled swirl of a thick dried apricot compote. It occurred to me that my friend could make a fresh cherry compote (well-reduced...slightly thicker than the one I added to my semifreddo) and use it in the same way in this recipe. She tried it....and liked it...but reported back that she was really wanting scones that were punctuated with juicy chunks of fresh cherries rather than cooked cherries. Also, in the interim she had found a recipe for fresh cherry scones and had tried it too. She was surprised that the recipe worked...that the cherries didn't flood the scones with juice. She emailed the recipe to me so I could also try it. As I examined it I was struck by its similarity to my drop scone recipe. There were also some big differences, but the similarities were enough to make me want to try my old recipe—which I knew to be a good basic recipe—to see how it would work with chunks of fresh cherries. They turned out beautifully....light, crusty, tender, moist and studded with chunks of juicy cherries. I am a bit stumped as to why the cherries don't make the scone soggy or gummy...but they don't. I can think of several reasons why this might be the case...but in the end, I feel I should admit that I am only making an educated guess. As I have thought about it, the first thing that strikes me is that these scones have an unusually high amount of egg. This gives them a lot more structure than a typical scone and more of an ability to absorb extra moisture. As an aside, this large quantity of egg could make for a dry scone. But, there is also a higher percentage of butter in these scones which I imagine is responsible for counteracting the drying effect of the eggs. The other thing that is different about these scones is that you are directed to freeze them before you bake them. It is possible to successfully bake just about any scone from frozen, but for these particular scones it seems to be a necessary step. The mixing method is a bit unusual and I think tends to develop a bit more gluten than is desirable. Chilling—or freezing—the formed scones will allow the gluten to relax and as a consequence you will get a more tender scone. When fresh fruit has been added to the dough, I think the freezing step has an added benefit: Because the fruit goes into the oven at a much lower temperature, it will necessarily spend less time at temperatures high enough to cause it to begin to break down. Right about the time the cherries get hot enough to begin to soften and give up their juices, the scone is done baking. But, as I said, this is mostly conjecture. However, because I think the freezing step is integral to the success of these scones, I wouldn't omit it...tempting as that might be. I love the fact that I can make these, freeze them, and then bake one—or two—whenever the mood strikes. Also, the freezing step makes them the perfect thing to make ahead in preparation for house guests. For those who love my cream scones, don't worry, I love them too and will not be abandoning them anytime soon. If I want a "quick" scone—one that I can mix and bake on the spot and is amazingly delicious to boot—I will always choose to make cream scones. But, if I want an incredibly delicious fresh cherry (or fresh apricot!) scone, I will be making these from now on. Pit the cherries. Halve and quarter them. Cut the quarters crosswise. 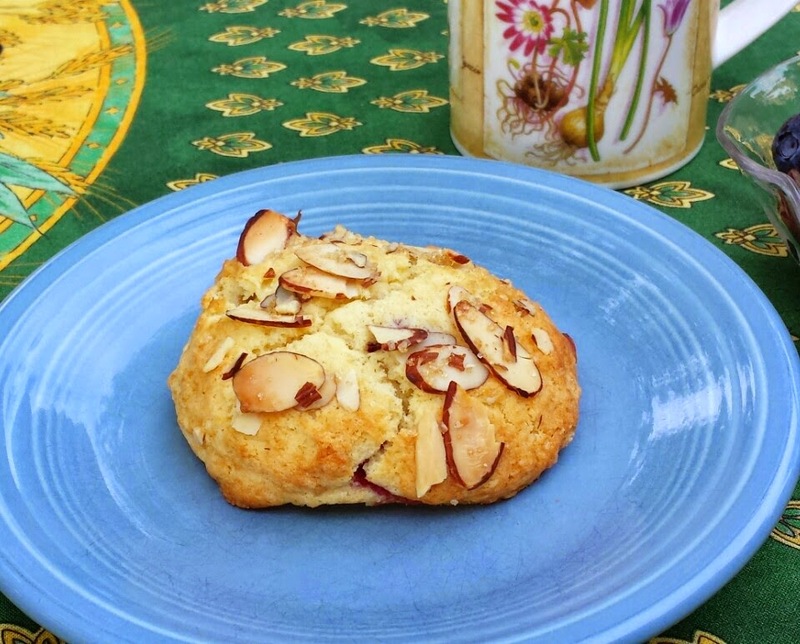 Your goal is 1/3- to 1/2-inch chunks of cherries—small enough to be well-dispersed in the dough, but large enough to be discernible chunks of sweet cherry in the baked scone. Set aside. Combine the flour, baking powder and salt and set aside. Cream the butter and sugar until pale and fluffy (about 3 minutes). Add the eggs in 5 or 6 additions, beating until incorporated after each addition and stopping to scrape down the bowl once or twice. emulsify smoothly and completely into the butter sugar mixture. Beat in the almond extract. Blend in half of the dry ingredients. Add the yogurt, mixing just until blended. Add the remaining dry ingredients to the bowl, followed by the cherries. By hand, fold just until the flour is absorbed and the cherries are evenly dispersed. Using a 1/3 or 1/4 cup capacity ice cream scoop, scoop the dough onto a parchment-lined baking sheet. Using a spoon or rubber spatula, flatten the scones slightly. Sprinkle each generously with the almonds and then the sugar. Loosely cover with plastic wrap and freeze until hard. Cut the parchment in between the scones and place the scones (attached to their parchment squares) in a freezer bag. Freeze for up to 6 weeks. To bake, place as many scones as you like on a baking sheet (spaced evenly, 2 to 3 inches apart) and bake in the upper third of an oven preheated to 375°F until golden and springy to the touch—about 25 minutes. Transfer the scones to a rack, cool slightly and serve. Makes 12 to 14. I have made these with as few as 150 grams of cherries (a level cup) and as much as 200 grams (a generously heaped cup). I think 200 grams is the maximum amount of fruit the scones will hold...more than that and they will tend to be a bit damp. Apricot and Plum Variations: Replace the cherries with 6 oz. of fresh apricots or plums (2 or 3)—pitted, sliced and then cut into a 1/3- to 1/2-inch dice. If you like, replace the almond extract with 1 t. vanilla. Top the apricot scones with finely chopped pistachios and the plum with lightly toasted (and skinned) chopped hazelnuts. I love that they must be frozen first- a perfect thing for a singleton like me. Will share this recipe with Sheryl too. Her summer always includes many houseguests. Your scones look wonderful - great flavor! Thank you both!! Lis, you'll have to let me know what you think...and if Sheryl makes them for her guests I would love to hear how they are received! Delicious recipe. Great crumb. Thank you for the pictures and detailed instructions on hows and whys. I would love to be in your classes. However, we are up in BC. I, too, will use this recipe for guest breakfasts and for my own portion control. :) The freezing piece is brilliant. Thank you for this blog. I made these this week because we have loads of wonderful cherries in the stores, too. They are wonderful. As everyone else has said, freezing is a great help since we rarely need much. The turbinado sugar is a great addition. I didn't realize a little bit of large grain sugar would add so much to the taste. Thank you so much for sharing the recipe and all the details to make it work. Thanks Ann! I'm so glad you enjoyed them. 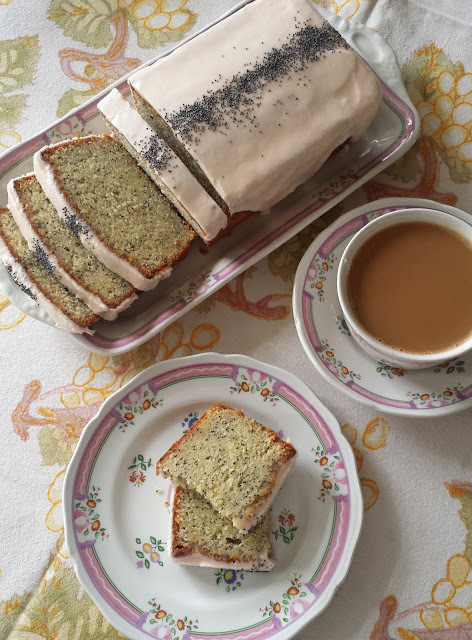 I love using Turbinado sugar on top of baked goods...scones and muffins in particular benefit (if you haven't tried my pumpkin chocolate chip muffins, you should give them a try this fall...they have a final sprinkle of Turbinado too). P.S.--It looked like you had a hard time getting your comment to go through...sorry about that. I think it's because I have it set so I see them before they show up on the blog. Yes. I kept getting a message that my verification was wrong. It gave me a second code, then a third. I finally decided I hadn't typed that badly and thought I'd wait till today to see if you didn't get it. Sorry. Thanks for the tip about the muffins. I will try them this fall.